Stephen Collins, Catherine Hicks, Barry Watson et al. 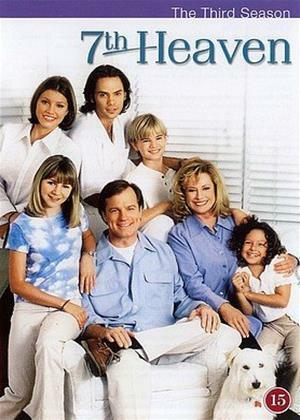 The critically acclaimed 7th Heaven details the trials and tribulations of a loving spiritual family. Produced by the legendary Aaron Spelling, the saga of parents Eric (Stephen Collins) and Annie Camden (Catherine Hicks) and their five offspring: college-age Matt (Barry Watson), independent Mary (Jessica Biel), boy-crazy Lucy (Beverley Mitchell), teenage Simon (David Gallagher), and precocious Ruthie (Mackenzie Rosman). This season, the family of seven expands as Annie gives birth to twins, Sam and David. But just because a couple of newborns have arrived doesn't mean that the problems of the older children are over. A jealous Ruthie runs away from home, Mary and Lucy rebel against their household duties, and Matt is obsessed with stopping the wedding of his ex-girlfriend! And yet the show continues to offer heart and humor, while boldly examining contemporary issues. Experience all 22 episodes of Season Three of 7th Heaven, the longest running family drama in television history!